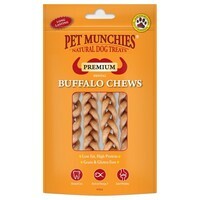 Pet Munchies Premium Dental Buffalo Chews are premium gourmet dental chews that have been made from 100% natural human-grade grass fed buffalo. Long-lasting and designed to satisfy your dogs’ natural instinct to chew, these healthy chews help support good oral health; helping to reduce tartar and plaque for healthy teeth. The delicious chews have also been infused with salmon oil which is good for skin and coat, and due to the rich levels of Omega 3, will also help to aid joint mobility.